Gold broke all time record in $US today. It is a confirmation that the bull market is alive. Some people could argue that this may be a double top. That is definitely possible. However, if gold does get up to more than $1100, then I think that argument is a little weak. 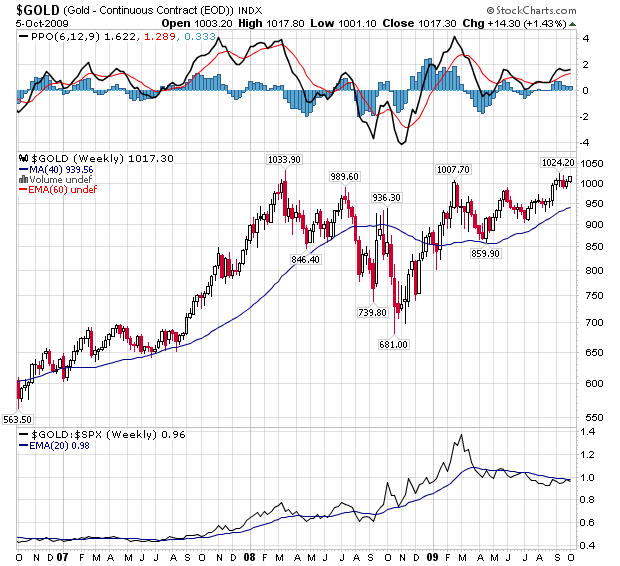 Furthermore, based on the recent consolidation of gold prices, it just doesn’t look like it’s a double top formation. A double top usually falls sharply afterwards. Gold consolidation has been quite flat, indicating its continual strength. In fact, gold has indeed climbed a giant wall of worry. Majority of gold investors have not put in more money because of fear in impending stock market correction. I have no way to know whether the gold mining index HUI is making a small double top right here. It is certainly possible. But I try not to predict the short term moves too much. After all, it’s not easy to out-smart the markets on a daily basis. I understand that the great trader Bill at BillCara.com has sold partially out from stock markets & gold/mining. I also know that JC, one of the very few successful traders amid 2008 stock market crash at www.simplyprofits.org have gone out of markets for quite a while. I understand that the person who called the credit market crash in 2007, Bob Hoye (normally at HoweStreet.com), has turned bearish on general stock markets, and especially on silver, for a number of months. But I kept thinking to myself that in this wave 3 up, most people/traders will be missing the bull ride. Ha, ha, myself included!! The next big milestone if it comes will be a new high in international currency, first in Euro, and then in commodity currencies. I continue to believe that this new high will NOT come until the next big fall in the financial sector happens, which may be next March/April. From that regard, at least, for the international investors, they probably still have time to digest the current volatility in gold market. However, I wonder whether there may be some fireworks first when priced in $US before the year ends. Yeah, I know $US is supposed to rally right here right now. But is this another episode of “markets stay irrationally longer than one can stay solvent”? Next Friday is an option expiration week. Maybe there is a chance of pullback. Maybe BillCara & Bob Hoye is right. I dare not to go in nor go out of this market. Brave trader I’m not. Patient investor I am, and I need to take actions accordingly.